Throughout our history, the Horse has been recorded as a figure of importance in mythologies and cultures around the world. Spiritual messages are believed to be passed through sightings of horses, and as spirit guides, the colours, markings, and bearing of the horse in question can indicate the type of guidance we are receiving. According to many, paint horses – those with white and solid colours, represent freedom and adventure, white horses call us to spiritual investigation, and black horses symbolize shadow and mystery. Horses played a huge role in the longer now of the Second Insight, but as we moved forward technologically, many of us lost the likelihood of creating those wondrous relationships. Happily, there is a shift occurring as more and more people are interested in restoring horsemanship back into their lives. We are seeing a resurgence of the horse-human relationship. Their beauty and grace, along with the freedom and spirit they represent, combine to give them a power that, for many of us, is beyond compare. Over the years, a multitude of papers have been published on the benefits of working with horses. However, long before science could back it up, many spiritual teachings told of horses restoring us. And now, with all that is changing in the world of health and wellness, the Horse is finally being given their rightful place among healers. They have a presence that can induce a state similar to meditation, where time becomes meaningless and something other takes over. Often following time with horses, we overflow with feelings of balance and wellbeing. I’ve personally been fortunate enough to both witness and experience this phenomenon numerous times, and believe that this effect is caused by their souls, by the energetic bodies of horses. 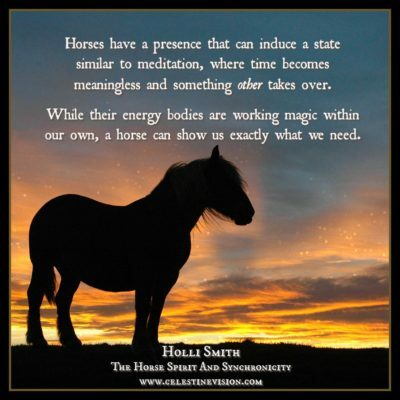 Many modern day energy workers believe that horses have expansive auras, much larger than our own or most others mammals. They remain grounded, tuned in and open to the Universal energy with no need to ‘steal’ energy. Instead they act as open conduits, sharing this gift of energy freely – with us, with each other, with the world at large, without being drained themselves. My world changed in one day. I grew up in a ranching community, and come from a family of cattle ranchers and horsemen, but never owned horses myself until I was an adult. I started taking my animal-loving daughter to horseback riding lessons and shortly after, was riding myself as well. During this same period of time, I, like so many others, suffered from panic attacks. At times I was okay, but at times they were extreme to the point of debilitating. One day as we headed out to go riding I had a panic attack, and I am forever thankful that I did. I was embarrassed and red eyed. My entire body was shaking, sweating, and I smelled like fear. And then, I touched Kisses, the horse who changed my life. As my hand made contact with her, it was as though she flicked the off switch on my fight or flight response. Everything relaxed, the fear, the anxiety, the shaking. My heart rate slowed and I felt like I could swallow again. I went home that day knowing that working with horses to help people heal was a part of my calling, my life’s purpose. That day, out of one of the worst panic attacks of my life, a horse and a moment of synchronicity led me to a new life. The gifts horses give us. Nearly a decade and a half later, I am still in awe of the amazing gifts that horses offer us. They increase levels of health and happiness, helping us to transcend the mundane, while inspiring love, compassion, and understanding. While there are those who have had negative horse experiences due to extenuating circumstances, the number of people who claim feelings of worth and wholeness through time with horses is staggering. Horses of the right temperament offer us a place to relax, to be accepted exactly as we are, and encourage us to let go of our stress. This is especially true for the vulnerable, when we are unwell, suffering, or traumatized. We can’t make a bad impression on these horses just by being ourselves. They don’t care what we dress like, if our hair is a mess, or if we have scars and baggage. While they can learn not to trust people who treat them poorly, we can make mistakes in their presence and still be welcome. We can do things incorrectly and clumsily as we’re learning. We can be afraid, raw and real, and the next day they will be there for us, waiting for a scratch and a nuzzle. They have a sense of what we need, of what gaps need to be filled. Horses teach us to tune in to our own energy, intuition, and sensitivity. And while their energy bodies are working magic within our own, horses can show us exactly what we need, whether that means lending their shoulder to cry on or acting as a mirror and showing us the hard truths about ourselves. The karmic effect spoken of in the Third Insight also become immediately apparent through time spent among them. While horses are naturally very giving, they are amplified by what they get, so the more giving of love and kindness we are to them, the more they give back. 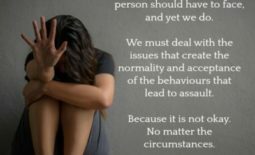 The cause and the effect happens almost simultaneously and is impossible to ignore. This leads to creating giving and respectful relationships, where we learn to communicate effectively in order to create real and lasting bonds. I believe that horses have an important role to play in the emerging culture of the Ninth Insight, and while it is definitely not feasible for everyone to own horses at this point, there are options available for people who wish to learn about and safely engage with them. People offer healing sessions and retreats with horses, therapeutic facilities take volunteers, farms and ranches provide tours and rides. The Fifth Insight – The Message of the Mystics speaks of a deep spiritual connection and there is no where I’ve felt this play out more strongly in my own life than being in nature with horses. For anyone who has felt called to be with horses, I urge you to listen. The stirring is in you for a reason and the experience is amazing. 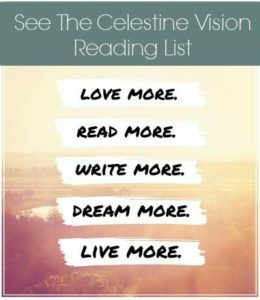 To be kept up to date with our latest Celestine initiatives, subscribe to our CV newsletter.